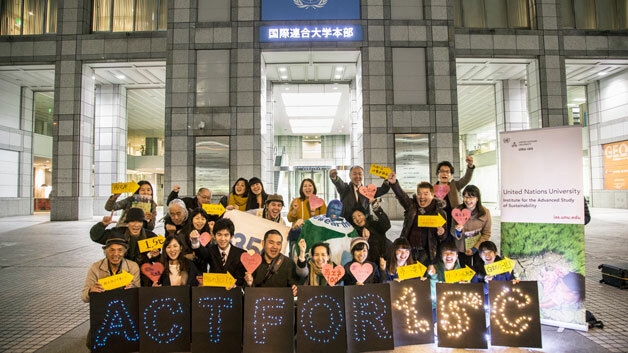 On 4 November 2016, UNU-IAS, the Global Environment Outreach Centre (GEOC), and the Japan branch of international environmental NGO 350.org held an event to celebrate the enforcement of the Paris Agreement as a part of the Act for 1.5 °C campaign. Participants gathered in front of UNU Headquarters and used LED lights powered by solar battery to spell out “ACT FOR 1.5 °C”, calling for all countries to accelerate actions to maintain the “increase in global average temperature to less than 2 degrees above pre-Industrial Revolution levels and pursue efforts to limit the increase to 1.5”, as stipulated in the Paris Agreement. The action was taken as a part of GEOC’s commitment to foster partnerships between various stakeholders, including international organizations, national governments, local governments, companies, nonprofit organizations, and citizens, in order to create a sustainable society. For more details (in Japanese), please refer to this link.